The 'Hands To Myself' stunner was on top form as she helped James Corden make his way to work! James Corden's 'Carpool Karaokes' are on another level when it comes to viral videos. Within hours, the view count is usually already in it's hundreds of thousands and guess what? Selena Gomez' edition has done just that. In the first three hours of it being live, the video had already amassed half a million views! 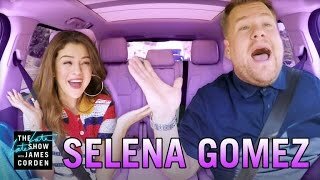 We see Selena and James go into a Macdonalds drive-thru, ride a rollercoaster and even belt out Taylor Swift's Vodafone Big Top 40 hit 'Shake It Off'.